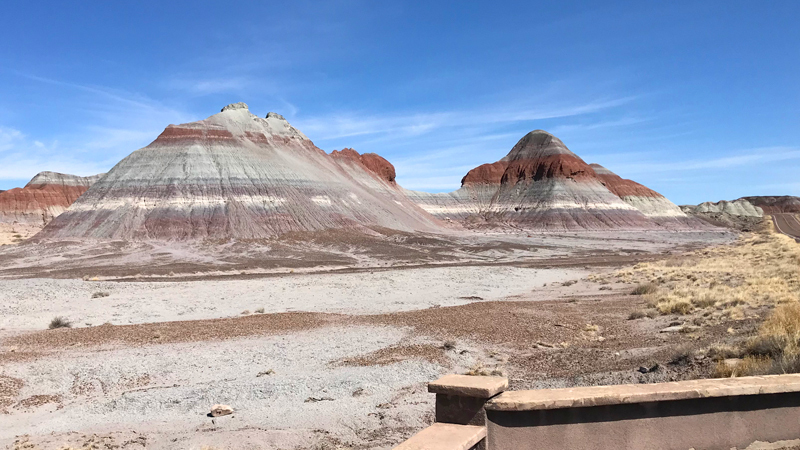 When driving through Petrified Forest National Park from the southern entrance gate, you first drive through the Flattops and a wide expanse of flat desert. But then, seemingly out of nowhere appear tall, cone-shaped hill striped with almost perfect layers of reds, pinks, blues, greys, purples, and white. Known as the Tepees, the small mountains are stunning and the roadside pullout begs you to stop for photos. And, if you’re like us and you can’t get enough of the wildly colorful desert, nearby is Blue Mesa Road and the Blue Mesa Trail, where you’ll be surrounded by the vibrant colors and rich textures of the Arizona Painted Desert. The Tepees are badland erosional formations in Petrified Forest National Park. As part of the Blue Mesa Member in the Chinle Formation, they consist of thick deposits of grey, blue, purple, and green mudstones and white minor sandstone beds, and are colored by iron, manganese, and other minerals. The Chinle Formation was deposited over 200 million years ago during the Late Triassic Period. The colorful badland hills, flat-topped mesas, and sculptured buttes of the Painted Desert are primarily made up of the Chinle Formation deposits. Within Petrified Forest National Park, the Chinle Formation is further divided to include the Blue Mesa Member, the Sonsela Member, the Petrified Forest Member, and the Owl Rock Member. The Teepees are a bandland formation in the Painted Desert of Petrified Forest National Park found directly off the main Park Road, Arizona 86025 in Navajo County.